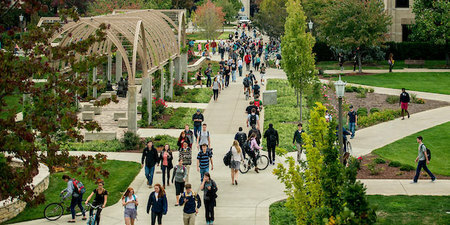 In order to preserve the safe and pedestrian-friendly nature of the Notre Dame campus, the University has instituted a permit system to restrict vehicle operation on sidewalks and pathways. Only permitted vehicles are allowed to use sidewalks to conduct approved University business. University offices and vendors (through University offices) may apply for permits on the Notre Dame Security Police Department Parking Services website, ndsp.nd.edu. Parking Services will issue permits on a temporary, annual or ongoing basis with the approval from the head of a division or college (VP, AVP or dean). Once issued, the permit must be displayed on the vehicle. Notre Dame Security Police enforces the permit requirements. The permit system is the key provision of the Pedestrian Safety Procedure recently developed by Notre Dame’s Safety Operations Committee. The full Pedestrian Safety Procedure is also available on the NDSP website. Permits are not required for special events designated by the VP for Campus Safety. This includes student move-in and move-out days, for example. Unless permitted by Parking Services, over-the-road vehicles, such as Kubotas, are also prohibited on sidewalks. Transportation Services will continue to register golf carts. Only vehicles possessing a valid permit or exemption may operate on pedestrian sidewalks. Vehicles operating on Campus sidewalks must be conducting University business. As has been the case, only trained operators are allowed to drive golf carts and approved Cart Access Routes must be followed. Originally published by Gwen O’Brien and Marissa Gebhard at evp.nd.edu on May 22, 2018.